N. D. Wilson. Death by Living: Life Is Meant to Be Spent. Nashville, TN: Thomas Nelson, 2013. 208 pp. $19.99. The first thing I’ll note about Death By Living, N. D. Wilson’s follow-up to his celebrated Notes from the Tilt-A-Whirl, is that I couldn’t give you a book report if I tried. Much like the former volume, Wilson’s direct yet tilt-a-whirling style puckishly mocks the straight-laced summary-reviewer for even thinking to attempt the mighty feat. For return readers looking for quick comparison between Notes and Death, I’d say that if the last one changed the way I thought, this one might change the way I live. Notes invites you to embrace God as the sovereign, beyond-imagining author of this ridiculously unexpected universe. Death challenges you to live as a character, or rather, as a sub-writer of enfleshed, breathing words. Big ones. Interesting ones. Once again, you’ll find yourself in a well-shaken cocktail of poetic memoir, philosophy, theology, sharp wit, polemical fisticuffs, hilarity, and exhortation in the form of a paean to the grace of a life well-lived in the shadow of eternity. For the newcomer, you may want to strap in first. “Death by Living, life is meant to be spent.” That’s Wilson’s thesis and philosophy of family life (xi); scuffed knees are apparently as much an evidence of life as a pulse in the Wilson household. In many ways it’s a quirky entry into the venerable devotio moderna genre, along with Thomas à Kempis’s De Imitatione Christi—only in this one we’re encouraged to follow our covenant head, take up our swords, fight the dragon, and live hard until it kills us like Jesus, the image of humanity done right (62, 79). That might involve a little dirt. Don’t worry though, resurrection should take the stains right out. As the book defies summary, being somewhat unruly and misbehaved, I’m simply going to highlight a couple of points and make one note on style for pastors. It’s trendy for people to talk about life as a “story” nowadays (3, 19). But Wilson—a bestselling novelist, occasional screenwriter, and fellow of literature at New Saint Andrews College in Moscow, Idaho—suspects for most of us this talk is just an idealistic (or ironic, depending on your generation) bluff that enjoys placing ourselves in the role of grand protagonist in our own perfectly edited biopic (71). Most of us haven’t stopped to think through what it means to be a character (small, yet significant to an infinite God) in the unfolding narrative of redemption in which every atom has a narrative trailing back into eternity (5). We forget the way God’s stories work: with real, dragonish problems, heroes, and solutions a bit more robust than an application of sunscreen can handle (40). We don’t stop to read the events of our lives against the backdrop of unfathomably wise, sovereign, unpredictable, but faithful grace. The French philosopher Blaise Pascal once remarked, “Cleopatra’s nose, had it been shorter, the whole face of the world would have been changed” (Pensees, 180). What does it mean when the shape of a nose, or the unwitting actions of one stranger at a key point in our ancestor’s story, or a key conversation, can change the course of history (141)? Have we really thought that through? In many ways, Wilson calls our bluff and invites us to view life through Pascal’s theory of history, weaving theological analysis (it's not so dry as that phrase implies) into the stories of his own grandparents, who’ve lived long, and were given by God many stories leading, quite improbably, to his own. If we thought it through, we’d realize that our existence is pure gift. To call the ins and outs of our lives happenstance or accident is a failure to take seriously the story-like nature of life itself and the authorial genius of our God. More than anything, Wilson acts as a master bard of the grace of providence, debunking the myth that trust in a sovereign God is a recipe for fatalistic paralysis or foolhardiness. Instead of a verse-laden argument for God's sovereignty, he paints a picture of what a Reformed doctrine of providence looks like with everyday, narrative flesh on it: it is risk because we are held in the sure hands of our Creator; it is courage to be a great character written by a faithful author; it is gratitude for every breath in our lungs; it is meaning in every quirk and plot twist; it is an exhortation to sacrifice that follows after the author-become-character who guarantees that our deaths find resurrection joy on the other side. Which brings us to death. I mean, that’s in the title, right? Another philosopher, Socrates, told us in the Phaedo (63e-65a) that the practice of philosophy is a preparation for death. Wilson’s philosophy might be considered preparation for life in light of death and resurrection. If the philosopher ought to be joyful at the release of the soul from the prison of the body, since its pleasures have no hold on him, Wilson wants us to drink more deeply of every grace-given moment of our existence in this good-but-fallen-and-being-redeemed world. To that end, he keeps reminding us we’re going to die. Actually, we’re one step closer with each breath, each choice, each moment spent. Time moves forward, rushing, galloping toward the close of our stories. (Confession: I used to tell the high schoolers I substitute taught to consider their inevitable deaths during silent reading time. No, I wasn’t fired. I was just doing my best Socrates.) This reminder could be morbid, but Wilson wants us to see death as more than a curse (which it is), but also as a gift in a sin-broken world. For who would want to live in the world as it is—as they are—forever? With my already aching bones and, even worse, my recovering but still sin-sick soul, the release of death is a relief. For Christians, of course, death isn’t the absolute end of our story. It is more than a comma, though. More like a full stop. The close of a significant chapter. This means life has been given to us, not to hoard, but to be spent prodigally as we imitate our prodigal God who gave himself for us. Death means we’ve been given a certain space to create, to write our sub-novels within the novel of our ultimate author. He’s given us pages to write on, and while they’ll be masterfully woven in, there’s still only a few (166). What story will we write? Wilson issues a robust call to a deep, rich, risky, sacrificial, joyful, exhausting, and ecstatic life—one that takes us beyond our perpetually curved-in-on-self existence. To do that, he deploys a level of linguistic friskiness that disrupts, disarms, and rouses us to life. Evangelicals, and especially American Reformed ones, need to get better at conversational-literary-poetic prose. Even that last phrase is part of the problem. I should come up with a better term than “conversational-literary-poetic,” but that’s the best I’ve got right now to describe the simultaneously surreal and straightforward poetic style. We’re good at advancing arguments, parsing passages, making numbered observations on texts, and gospelizing literally everything (figuratively-speaking). Writing and preaching with dripping, juicy meat on the bones of our structural outlines isn’t too common, though. While the Spirit ultimately enlivens the Word in our hearts, he has decided to work through means. If we want people to embrace the doctrines of the faith with the kind of abandon Wilson (and the New Testamant) calls for, it’s better to give him something lively to work with. 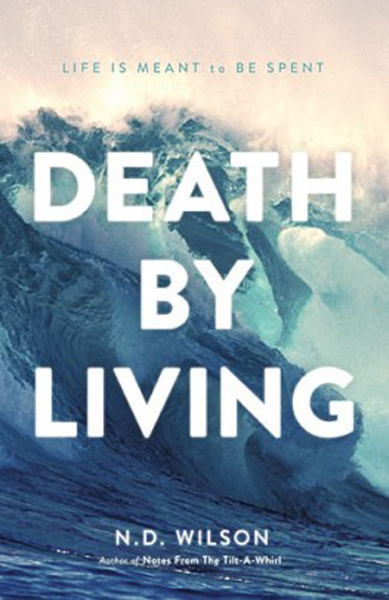 If you hadn’t picked up on it, Death by Living is a great book. Buy it. Read it. Give it away. Most importantly, though, try to live it.